The Seychelles archipelago consisting of 42 granite and 73 coral islands lies in the Indian Ocean just 4 degrees south of the equator and 1000’s of miles from anywhere. The islands are stunningly beautiful and have more nature reserves and marine national parks than any other country. The granatic islands which tower to over 900m are covered in lush vegetation and where you will find 100’s of the finest and most beautifully picturesque beaches in the world. Even the busiest of these have few people on them and it is not difficult to find a rocky cove where you will be completely alone on pink tinged sand. The thing that most surprised me about the Seychelles was the huge amount of activities there are to do there. While perfect for sunbathing, romance and watersports there are also miles of nature trails for walking and discovering. The forests are a haven for nature lovers and birders, being home to many of the world’s rarest bird species. You will also find the symbolic Coco de Mer palm. Extinct elsewhere, the palm is endemic to the islands of Praslin and Curieuse and has the largest leaves and nut in the world. 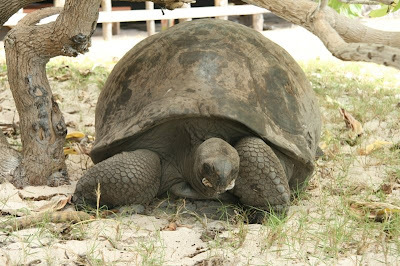 The Seychelles are also home to the giant tortoise, once almost extinct. On Curieuse, a marine park island, there is a giant tortoise breeding scheme in place and home to around 300 of the animals. 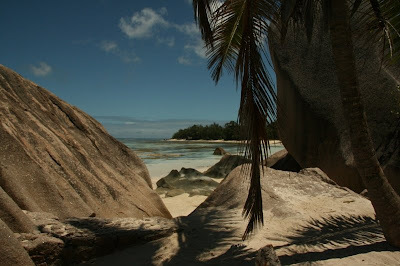 As my trip was for only five days it just gave me a small taste of what the Seychelles is about. During the trip we did a three day cruise on the Sea Shell, visiting Praslin, Curieuse and La Digue islands and also stayed one night each on Praslin and Mahe. Silhouette cruises run four sailing vessels. These cruises are perfect for those wanting a mix of diving and non-diving activities or for divers with non-diving partners as the itineraries cater equally for non divers and divers. Sea Shell and Sea Pearl were built in the 1920s and are full of old world charm. They both have eight air conditioned cabins, three showers and four toilets. The water is solar heated so not always hot. 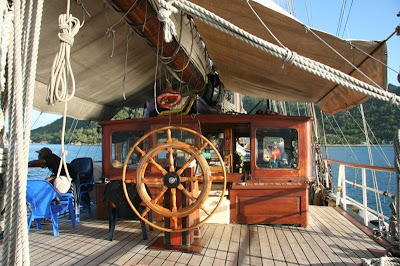 These vessels are great if you don’t mind not having an ensuite cabin and want a sailing vessel with a bit of character. Our captain and crew were great and the food was simple but good, most meals were fresh fish caught daily. The menu is set but dietary requests will be catered for of course. Sea Star and Sea Bird are modern sailing vessels with a higher standard of comfort and each has nine ensuite air conditioned cabins as well as two comfortable saloon areas. I viewed the newest of the vessels, Sea Bird and it is really a beautiful boat which I would recommend if you want to cruise in comfort. These modern vessels are much faster and therefore cover longer distances and are used for charters to the outer islands. The four vessels offer regular seven night cruises through the inner islands with daily activities including beach BBQ’s or picnics, walking, exploring, kayaking and diving. With no dedicated dive liveaboard in the Seychelles this is your best option if you want to explore the islands and do some diving. Typically, on a seven night cruise eight dives will be offered but for groups of divers a customised full diving itinerary can be arranged with around three dives per day. Trips to the remote coral atolls of Aldabra are possible during March and April. On my trip the first stop was Ans Possession off Praslin where we did a check dive - don’t expect fabulous visibility especially during the whale shark season when the plankton is rich. The visibility averaged 5-15 metres. The dive was pretty with plenty of surgeon fish, jacks, fusiliers, bat fish and loads of peppered morays. The next day we did an early dive on a granite wall. Depths are all fairly shallow in this region, seldom deeper than 14 metres so good for inexperienced divers. We spotted two large stingrays and several octopus along with the usual array of reef fish such as sergeant majors, burrfish, surgeon and parrot fish. After breakfast we went ashore on to Curieuse Island which until recent years was a leper colony and is now home to 300 giant tortoises which were almost extinct. There are several walking trails on the island but beware it’s very hot and some of the terrain quite steep but manageable if you take it easy. It’s a lovely walk though and you will get to see the tortoise, some over 100 years old just grazing lazily on the grass. They are very docile and particularly like being stroked along their necks. The boat crew prepared a BBQ lunch and we had plenty of time for some swimming before heading back to the boat for another dive. This time it was a coral garden sloping from 11-14 metres. Here we saw many large tuna, several small reef sharks and numerous morays while the non divers got a lazy afternoon with beach activities or relaxing followed by afternoon tea. The following morning the boat headed off early for a visit to La Digue Island where time stands still. There are only about 20 vehicles on the island and the mode of transport is either by bicycle which costs 10 euros per day or ox cart. We hired bikes and visited the L’Union estate, an old coconut and vanilla plantation where you can see how coconut oil is pressed in an ox-driven mill. The trail south lead us to one of the Seychelles most beautiful beaches famous for its amazing shaped granite rocks, powder white sand and azure sea - these coves feature in many brochures, movies and advertisements. If you cycle over the east coast which is slightly uphill there are spectacular beaches with huge waves but unsafe for swimming. The island is great for a half or full day trip or if you wish to stay on the island La Digue Island lodge has 69 air conditioned rooms built of wood and thatched with leaves, the lodge also has a pool and dive centre on site. There was an afternoon dive around La Digue which unfortunately I had to miss due to developing a rather nasty cold. On day three we left the vessel after breakfast while the rest of the guests were heading over to Praslin for walking in the Valle De Mai with its famous Coco de Mer palms. On Praslin we stayed at the beautiful Paradise Sun hotel which is a four star boutique hotel. 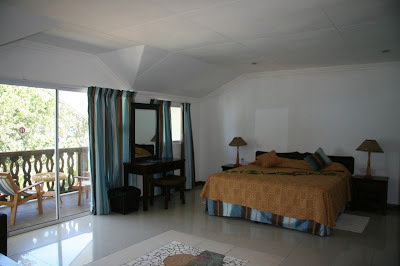 Rooms are chalet style and very tastefully decorated. They have air conditioning although I preferred to have the air conditioning off. With the shuttered doors closed and the ceiling fan on it was plenty cool enough. While the group went off for an afternoon dive to Booby Island where they saw sharks, octopus and dolphins I took myself and my cold off to explore the main beach area which had hardly anyone on it. If the Paradise Sun hotel is out of budget there are numerous other accommodation options such as the rustic guesthouse Laurier or three star Acajou hotel. The food at Paradise Sun was as expected - excellent. I opted for the fresh fish of tuna and job fish. On our last day we took the ferry back to Mahe. The trip takes around one hour and is a good option if you are going to be doing more diving. Alternatively you can take a 15 minute flight. We stayed in the main Beau Vallon Bay area at the Berjaya hotel but there are many hotels and guest houses on the bay to suit all budgets. I recommend the four plus star Fisherman’s Cove boutique hotel or for more budget conscious the small hotel Augerine which has 15 simple but very tastefully decorated rooms and a small barefoot restaurant. Both are five to ten minutes walk from the Underwater Centre, or pick ups can also be arranged. The dive centre is British-run and well set up to cater for groups and individual divers of all abilities. They have four fully equipped custom-built dive boats and run a full daily diving programme to short and long distance sites. In addition to diving during the whale shark season of September and October the centre runs whale shark snorkelling encounters. The Marine Conservation Society Seychelles (MCSS) was set up in 1997 and is a local non profit organisation focusing purely on marine research and management. The society successfully lobbied the government to declare the whale shark a protected species in 2003. The whale shark snorkelling trip costs $125 and all income goes into the project which is run by Dr David Sanders and a group of interns. They send up a microlite to spot the sharks and if there are positive sightings the boat leaves in the afternoon. Unfortunately last year the sightings were very low and this year sees the same trend, although speaking to divers onboard they told me in previous years they have encountered up to 40 sharks in four days. The day I went out followed my usual luck and we didn’t get to see any whale sharks which is not surprising as only 2 had been spotted earlier that morning by the microlite. However, despite my disappointment I had a really good afternoon snorkelling with a school of 17 Mobula or devil rays which are like small Mantas. I also saw a shark, a turtle and several dolphins so I certainly couldn’t say the afternoon wasn’t enjoyable. In general the weather in the Seychelles is warm and humid, averaging 29°C throughout the year with more rain around November to end of January. As tropical islands close to the equator, the Seychelles experience quite a lot of rain at all times of the year, but this mostly occurs in brief showers followed again by tropical sunshine, hence the lush green vegetation. The South East Trade Winds are prevalent from May to September when it will be drier, breezier, and slightly cooler than during the remainder of the year. The North West Trade Winds are prevalent from October to April. This is a much calmer breeze, which results in increased humidity and calmer seas. Higher rainfall occurs during this time of year.The transition periods of April and October tend to be the calmest and hence the best visibility for divers but diving is possible throughout the year. Air Seychelles operate two direct flights from London each week; out on a Friday or Sunday and returning on Thursday or overnight on Saturday. In a nut shell if you are looking for a tropical paradise holiday with more to do than just diving then the Seychelles won’t disappoint. There is good diving to be found with the possibility of encountering some large species, but the Seychelles is not just about the diving, the islands have so much more to offer. Client Testimonial: Belize - December 2008 - A.W.